Jeevan joins Guild Yule as an articling student after earning her Juris Doctor from Thompson Rivers University. Prior to going to law school, Jeevan received a Bachelor’s Degree with distinction in Criminology from Simon Fraser University in 2014. 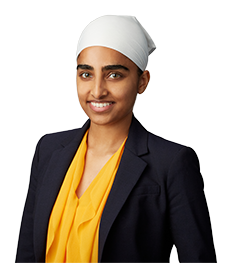 Jeevan is passionate about her community and has volunteered with numerous non-profit organizations including the World Sikh Organization of Canada. She was also an active member of the Human Rights Club, the Women in Law Club and the South Asian Law Students Association at TRU. These experiences fostered her enthusiasm for litigation and trial advocacy. Outside of law, Jeevan enjoys hiking and playing tennis.